Beetroot Saaru (Seasoned Beetroot Soup) and One year of Blogging!! Hi everyone...I am very happy to announce that 'Lakshmi Canteen' turned One yesterday. I am feeling as if I started it yesterday. The whole year was very fruitful. Thank you everyone for joining hands with me in this journey. Hoping to post many more recipes in coming days. Now coming back to the recipe- Beetroot Saaru is a healthy dish. I got this recipe from my SIL. Once in a while, I am tempted to buy these red beauties but never use them. I keep searching for recipes and do nothing out of it. Then finally I make Upkari (stir fry) or cutlet. This time I wanted to try something different and luckily I got this recipe. I enjoyed it with rice and seasoned buttermilk. A fulfilling, healthy lunch! Try this simple dish and get the goodness of beet! Wash the beetroot nicely until it is nice and clean. Then remove the skin using a peeler and then chop it into big chunks. Cook these pieces in cooker with water and salt, as required. Cook it for three whistles. Allow it to cool. Once it is ready, grind the cooked beetroot pieces to a smooth paste. Use the leftover water, while grinding. Now transfer this paste to a pot and adjust the consistency by adding water. I kept it little thick. Then add asafoetida and mix well. Bring it to a boil. Then turn off the heat and then season it. For seasoning- Heat oil and then add crushed garlic pods. Fry until it turns golden brown and then add broken red chillies (I used chilli flakes). Fry it for few seconds and then turn off the heat. Serve it hot as a side dish to rice. Since this Saaru is little bit on the sweeter side, I also made a spicy curry to balance out the sweetness. Above measurement serves 3-4 people. Udidu- Moogadali Polo is a healthy dosa. In Konkani, Udidu means split black gram and moogadali means split green gram. This dosa is protein rich and doesn't require fermentation. 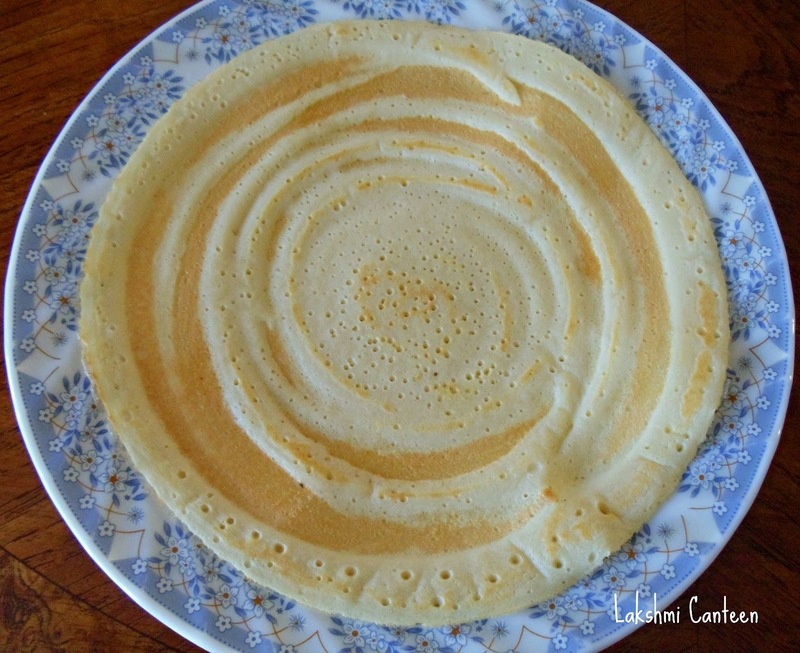 The dosa has a mixed texture. It is not too crisp/ soft. 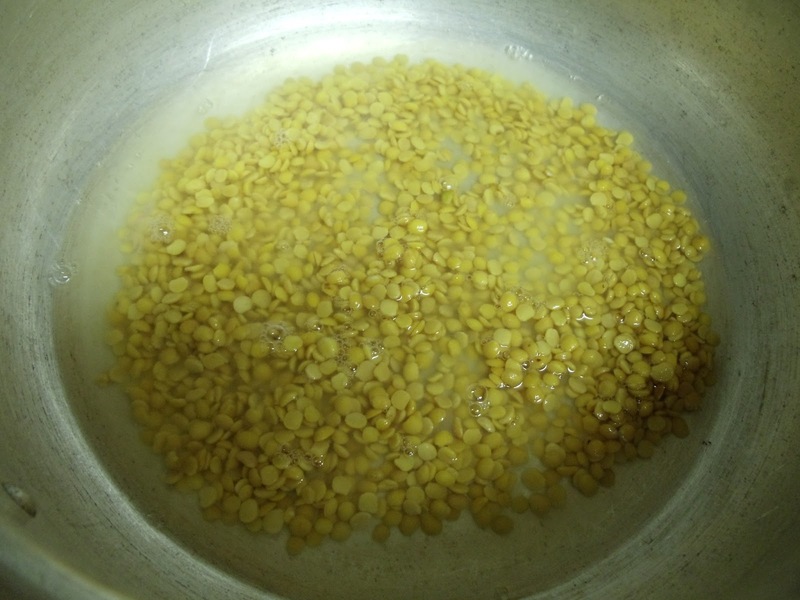 Wash and soak split black gram and split green gram in water, for 4-5 hours (I used the lentil without skin). Drain out excess water and then grind it to a smooth paste. Add water as required, while grinding. Then transfer it to a bowl. Add salt, chopped green chilli and ginger. Mix well. Adjust the consistency of the batter using water (It should be of dropping consistency but not watery). Batter is ready. Now heat the tawa/ griddle and once hot, pour a ladel full of batter on it and start spreading it. 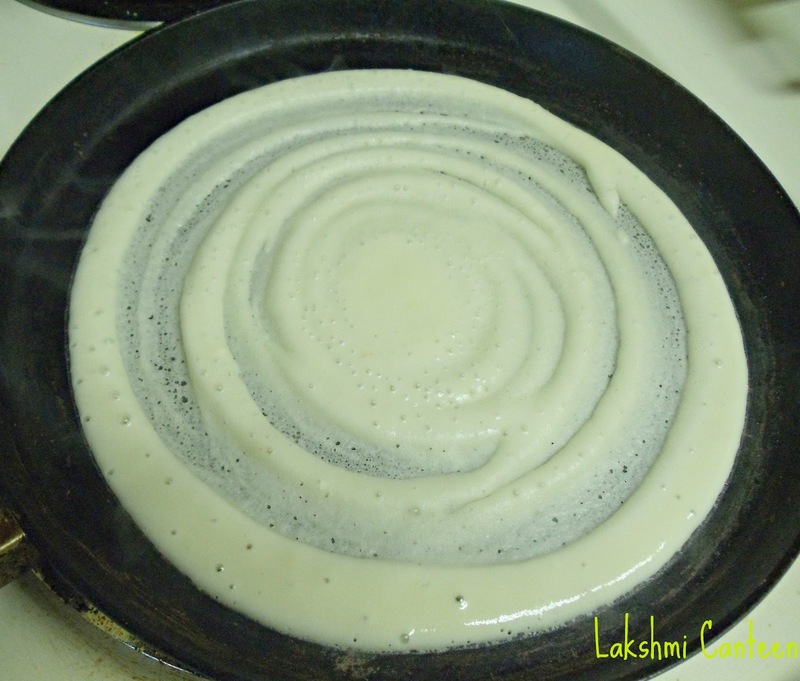 Sprinkle oil on the dosa and close it with a lid. 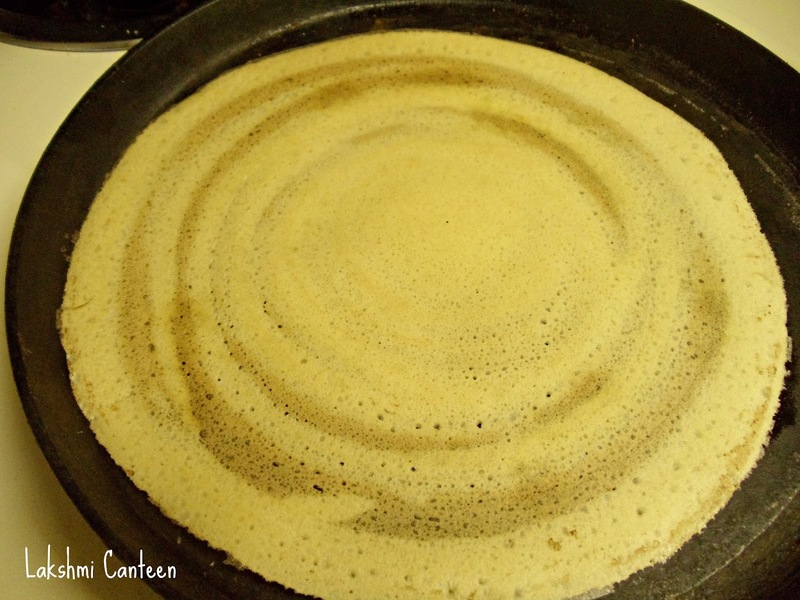 After half a minute or so, the dosa starts to turn golden brown. Now slowly flip the dosa to fry the other side, to get a slight brown color. Transfer it to a plate. Udidu- Moogadali Polo is ready!! Serve it hot with any chutney or curry of your choice. I served it with Ridge gourd peel Chutney. Above measurement serves three people. Tendle Puddi Sagle is a spicy, coconut based dry curry. In konkani, Tendle means ivy gourd. I got this recipe from my co-sister. Wash Ivy gourd and chop off the ends. Cut them into any shape. I chopped them small, as it gets cooked faster. Now crush the garlic pods using a knife. Then heat oil in a kadai. Add crushed garlic to it and fry them until they turn golden brown. Then add chopped Ivy gourd and mix well. Add salt and water, as required (don't add too much water at a time, as this is a dry curry). Close it with a lid and allow it to cook on a medium flame. While it is cooking, prepare the masala. 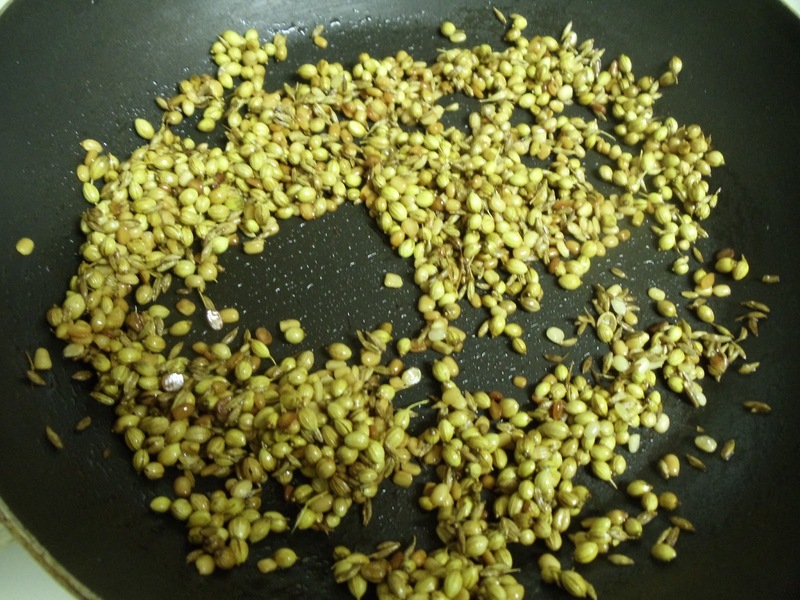 For Masala- Fry coriander seeds and fenugreek seeds in few drops of oil, until they turn light brown (see that they don't get burnt). Allow them to cool. Then grind these roasted spices along with grated coconut, roasted red chillies and tamarind to get a semi- coarse paste (the final masala should not be too coarse or fine. Add water just to aid the process of grinding. The masala shouldn't be watery). Once the ivy gourd looks cooked, add the ground masala and mix well. Add little water, if it is too dry. Check for salt. Let the masala cook along with ivy gourd for 4-5 minutes on a medium flame. Then turn off the heat. Tendle Puddi Sagle is ready!! Serve it hot, along with rice, rotis or chapathis. Above measurement serves two people. Bhajje Upkari is a healthy stir fry. It is very simple and can be made within 15 minutes. I got this recipe from my mother. In Konkani, Bajji means Red amaranth leaves. * You can also use Red Swiss Chard instead of red amaranth leaves. Clean and wash the red amaranth leaves. Then give it a rough chop. Now heat the oil in a kadai. Then add mustard seeds. Once it starts spluttering, add broken red chillies. Once fried, add chopped leaves. Leave it for a while, so that it shrinks (don't add water and salt till then). Once the leaves shrink, add salt, jaggery and grated coconut. Close it with a lid and allow it to cook for 4-5 minutes (add water only if required. I didn't add any). Once it looks cooked, turn off the heat. Bhajje Upkari is ready!! Serve it hot as a side dish to rice and any curry of your choice. Eerulli Tambuli is a yogurt based dish. In Kannada, eerulli means onion. I got this recipe from a good friend of mine. You can also check my another tambuli recipe here. Few months back- when I was talking to my friend, she told me that her MIL had made Majjige Huli. I knew that this is a tasty dish and asked her the recipe. She gave me the list of ingredients and the procedure (without the measurements...how can you expect that as well?:-)). She also told me to try Eerulli Tambuli, which is much simpler and can be made within 15 minutes. So finally I tried making it with my own measurements and guess what? it turned out tasty and I loved it a lot. You can try making it for lunch on a lazy Sunday. *You can also use buttermilk instead of yogurt. Grind grated coconut, chopped onion along with little water, to get a smooth paste. 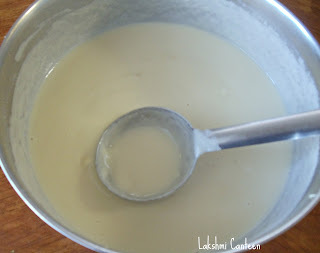 Transfer the ground paste to a bowl and add curd (or buttermilk), salt and mix well. Adjust the consistency by adding water (I kept it medium thick). Now add the seasoning to the prepared mixture. 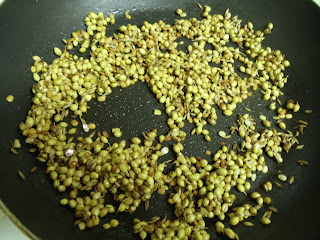 For Seasoning- heat ghee and then add mustard seeds. Once it starts spluttering, add curry leaves and broken red chillies. Turn off the heat. Serve it along with rice. Above measurement serves three people. Note: You have to finish eating the tambuli the same day as it is a 'No Cook' dish. Once refrigerated, it doesn't taste good. Beans Palya is one more popular dish of the Udupi Brahmins. This is my 3rd post on Udupi Special. I got this recipe from a magazine. Hope you all will try and enjoy it. This is one of my favorite dish. I have also eaten palya made from young raw jackfruit (not sure of its recipe). The palya (made in temple) turns out so perfect that it has the right balance of sweetness, spiciness and tanginess. *You can as well use Indian yam (suran) or Raw banana instead of beans. Heat oil in a kadai and add mustard seeds. Once it starts spluttering, add broken red chilli and slit green chilli. Fry for few seconds and then add turmeric powder. Mix well and then add chopped beans. Give it a good mix and add salt and sufficient water (The final consistency of the curry should be dry. Hence don't add too much at a time while cooking the beans) .Allow it to cook by closing a lid. While the beans is getting cooked, prepare the masala. To make masala- Grind mustard seeds and red chilli to get a powder. Then to this add the grated coconut and grind it coarsely. Masala is ready (don't add water). Once the beans looked almost cooked, add in the jaggery and tamarind pulp. Mix it and finally add the ground masala. Fry it until everything comes together (say for 3-4 minutes). Turn off the heat. Beans Palya is ready!! Serve it hot as a side dish to rice or rotis. Bele Saaru is one more popular dish of the Udupi Brahmins. As I had mentioned earlier in one of my posts- Boodh Kumblakayi Huli, this saaru/ soup is served daily in Shri Krishna temple and many other temples as prasadam to the deities. This is another favorite of mine and make it once in a while. Tamarind- A small piece, soaked in water. Wash and pressure cook toordal in sufficient amount of water, for 2-3 whistles. While the dal is getting cooked, prepare the masala. For masala- heat oil and then add coriander seeds. When it turns slightly brown, add cumin and fenugreek seeds. Fry until everything turns brown (don't burn them). Transfer them to a plate. In the same pan fry the red chillies as well and once done allow it to cool on the plate along with other spices. Once the spices are ready, grind it to get a fine powder (I always prefer to add water and make a paste out of it). Now, mix the cooked dal vigorously to break it down and get a smooth paste. To this dal, add jaggery, tamarind pulp, turmeric powder, green chilli, asafoetida, salt and the masala. Mix it well and bring it to a boil. Adjust the consistency of the saaru (soup) with the help of water. I always keep it medium thick (not too thick/ too thin). Once it comes to a boil, continue heating for 3-4 minutes and the add chopped coriander leaves. Turn off the heat. For Seasoning- Heat oil. Add mustard seeds. Once it starts spluttering, add curry leaves and broken red chillies. Turn off the heat and add this to prepared saaru/ soup. Mix well.